Big fan of your writing and research – I’ve recently begun collecting some canadian variants – always look for them in the stacks at my LCS – I was wondering if you could write an article or maybe just a quick reply to this and shed some light on Tales of the Teen Titans 44 95 cent newsstand Canadian variant – when I looked recently there were 35 graded examples on the CGC census compared to 2500 regular cover edition. I’m sure more will surface with the news yesterday of a nightwing movie but this comic has been popular for awhile – I’m thinking higher grade variant issues will remain at a low percentage compared to the reg cover. Would love to hear your thoughts and keep up the great articles! Hi Sean, you’ve definitely picked out a great key there, with Tales of the Teen Titans #44! I recently completed a project where I sorted the entire universe of 1980’s-published comics according to the number of total copies of each issue number that have been submitted through CGC to date according to their census data — the thinking being that this is a great way to “crowd-source” a nice list of important keys, because the more important the book the more likely the owner will want to get it graded/slabbed. Indeed, that #9 spot is held by the very book you mentioned — Tales of the Teen Titans #44 (and the count of total census copies has only continued to increase since year-end), with the 95 cent cover price variant showing 36 copies on record at CGC (inclusive of Signature Series), for a census rarity percentage of just about one and a half percent of the total copies graded of the issue number. And while coming in at the #9 spot overall as ranked by sheer number of CGC submissions, Tales of the Teen Titans #44 is actually the first D.C. book to show up on the list. In terms of shedding light on it as a specific example, I think that once one comes to understand the entire “class” of 1980’s Canadian price variant comic books — especially the fact that for Marvel and D.C. they were newsstand exclusives and therefore only made up a portion of the already-small Canadian market for comics — that the likely rarity percentage of the price variant for any given book can be understood within that context, and then from there we always still have to keep in mind there would be unknown variables like issue-by-issue sell-through on the newsstands, and the fate of the returns. For Tales of the Teen Titans #44, given the publication year of 1984 and an assumption of a downward-trending newsstand percentage through the decade with a 50/50 split of the Canadian market by the middle of the decade (50% direct edition and 50% newsstand), I’d peg the initial distribution rarity at 5.88 – 6.86% of the total sold for Tales of the Teen Titans #44, and then the notorious newsstand destruction rate is likely the single biggest factor diminishing that down to the observed rarity of surviving copies sitting here in 2017. Ben you blow my mind with your amazing attention to detail and research. I believe collectors have only begun to appreciate how rare books like tales of Teen Titans 44 Canadian variant are – and with research like yours it can only help to open people’s eyes to it. It’s crazy to think it sits at such a low percentage – I was pretty astounded to see it was number 9 on your list. I’m going to enjoy going over your data now so thanks for taking the time to give such a weighty response to my query – as always much appreciated. Excellent information… Thanks for all your quality research! Any chance you can do some research and post an article regarding the “No Month” Wonder Woman, batman, detective comics etc books that were released in the 80s. Basically all were non-newsstand copies with the price and issue number but no month on the cover. I believe they were released in multi-packs (maybe) and had a decent print run (another maybe). They all seem to get a high price for any copies. I know Wonder Woman 1-3, batman 352,356, 401-403, and detective comics 519 were just some examples based on a quick eBay lookup. Are they technically 2nd or 3rd prints or something different altogether?I havent spent the time checking how many other DC titles may have the same “variants”. Any info or insight would surely be appreciated by all of us. The seller’s description indicated the pack was purchased from a Walgreens. I’m reminded a little bit of the current DC multi-packs being sold exclusively in Walmart today — the Rebirth copies in the current packs are considered later printings, there is no price on their cover, and they’re sealed in plastic with two other comics. Wow Ben, that was great. Lots of important info in that nice little reply. I would love it if someone could put together a full list of every “no month pre-pack” variant produced. That in itself might be a great collection quest for somebody. As usual you have all the answers and know everything comic related. Lol. Keep up the great work Ben. Checking in daily for your next awesome article. Also, as a separate issue, how much do you know about the “so much fun” variants? I have a couple of them and they are so much fun to come across in bargain bins…pun intended. Hi Sal, I haven’t held any of these “so much fun” copies in my own hands to study them in detail, but, I came across listings for a few of them as I was hunting for Canadian price variants. One example issue I came across with a So Much Fun version was Batman #401. Overstreet Advisor Doug Sulipa has called the Batman issues in the range of #357-402, quote, the “Lowest Print Runs in the History of this Title (75,303 to 97,741 copies per month).” For issue #401, published at the end of 1986, we might expect about ~4% of copies to be Canadian price variants at time of distribution… which, against Doug’s range, would pencil out to a price variant range of ~3000-4000 copies. This math would argue for a lower count of our 1st print variants (Canadian price), versus the count of the later So Much Fun reprints, for this particular issue. Ben, hi. I’m about to make a video on my Youtube channel on the subject of newsstand variant comics. Would you mind if i referenced and linked to your blog and some of of your specific posts? Also, do you mind if I show some of the pages in the video? Thanks in advance. If you wanna take a peek at my channel just search Carlonbass on Youtube. I’m surprised you haven’t covered anything about Mark Jewelers Insert variants. These were prevalent over the 70s and 80s and only sold on military bases. I’m sure they had to have had very low print runs. These copies had the thick stock center fold pieces that profiled various types of military rings. Wow….FANTASTIC blog you have here! If we know of some more 1A variants that you haven’t added yet, do you want to know or do you already know and haven’t posted yet? I know of at least 2 titles. Also, I’m curious about the Sgt. Rock 423 you have listed on your price guide. I always thought 422 was the last issue. No mention of it in overstreet, eBay, or mycomicshop. Thanks Derek! Can you let me know where you saw Sgt. Rock #423? I only see our guide going out to #422, so if 423 was mentioned anywhere that’s got to be an error and I’d want to correct it. OK so I must have been looking at superman for #423 thinking it was Sgt rock for some reason. Here are some titles for you to research, which I can confirm exist. These are the ones I have. Star Trek Movie Special #1nn $1.75….#2 $2.85. Thanks Derek, You Rock!! 🙂 I will share these with the team and we will look into them! Moon Knight #35 $1.25. This is a strange one. Could this be the only 1A issue in title? Another great catch Derek! Upon hearing it, Doug remembered two other 52 Page Giants within titles that were otherwise direct edition exclusives, that we’re going to add too: Ka-Zar the Savage #29 and Micronauts V1 #57. What does the indicia say? I just got a Batman Annual #8 that isn’t on the list. $1.25 cdn. Thanks so much Salvatore for letting us know! 🙂 We’ll get to work adding it into the guide. I would like to find out more about the Mark Jewelers Variants. During my time in the Army, I collected quite a few Comics with these inserts. Where would I find reliable info on their Print Run or any other factors,Thanks. Type 13 Variants: Published simultaneously with standard or regular editions, such Variants come with ad inserts bound on stiff cardstock, always four pages in length, that promote a business partner, but which change the structure and size of the comic. Staples are sometimes closer than normal, and the book is sometimes slightly taller, by up to 1/16 of an inch. Mark Jewelers created this unique Variant, with ads designed to appeal to military personnel on government bases in the U.S. and overseas. Due to the binding process, high-grade copies better than VF/NM are hard to find. There is a new Archie Marvel Comics Digest. There is currently a Direct Edition with a US price and and Canadian Newsstand edition. Do you think this is the only current Marvel Newsstand comic?? Thanks Daved00d! 🙂 As far as I know, these digests are the first time Marvel’s content has been back on newsstands since they pulled out; one writer said of the Archie partnership: “The pair of publishers will work together on publishing new Marvel Digests, distributing them wherever Archie digests are sold. Yes, that means Marvel Comics are coming back to newsstands and grocery stores!” The only books mentioned as part of the partnership with Archie in the below press release appear to be the digests, so I don’t think there are others beyond that, for now. Hi Ben. Marvel made a Canadian variant for 6 different giants in the 1960s. These variants had no ads on back or inside covers. Journey into Mystery 1 Annual was an example. Verified with Paul and Doug. If I’m blind and missed it on your site, my apologies. Great job BTW on website. Thx. I just wanted to thank you for being the project organizer on the Canadian price variant online 2018 price guide. What an amazing piece of work. I can only image how many hours of effort were required to produce it. It will go a long way to promoting the collecting of these comics. I started collecting all 1980’s Canadian price variants last year in a BIG WAY. All Marvel, DC an even a few Disney and Archies. So far I already have over 1000 issues and hope to have at least all the Marvel and DC issues one day. Thanks Bob! If you find any errors or omissions you can post them to me here. Some other thoughts on what I think will expand the hobby of collecting Canadian price variants. 1. The biggest boost would be if the Overstreet guides somehow recognized the higher prices being paid for them. Not just in the annual reports, but in the actual price guide section. I know there are too many of them to list individually, but it would nice if there was a notation. For example, if the Batman listing said issues #352 to #423 had a Canadian variant price, and that the 9.2 price ranges from 1.5 to 5 times the direct edition price listed in the guide. Plus they could list a few key issues with individual lines for the Canadian variant, just like they list Marvel 30 and 35 cent variants now. 2. It would also boost the hobby if CGC and CBCS notated them as “Canadian Variant” rather than “Canadian Edition”. As soon as the word variant is used, the demand for them will expand, in my opinion. I know you have advocated for the use of the word VARIANT so keep up the good work. 3. Any online tool that would help people specifically track their Canadian variant collection would be useful. Because there are so many different issues available to collect, it would be nice to have a way to have a “complete checklist” tool online, where the collector could confirm whether they have a copy of that issue or not. This would help complete-ists like myself who are trying to build a collection of every single Marvel and DC variant that was published. 4. Eventually, it would be nice to see some studies of the relative rarity of the Canadian variants. Maybe like the Gerber rating? Are there certain issues out there that are much harder to obtain in ANY GRADE than the others? I am sure there are. They might be the last issues of less popular titles like Arak or Warlord, it won’t be titles Batman or Spiderman. Or maybe there was a publication issue at the printing plant that caused a certain issue to become very rare, because hardly any were printed? Only time will tell which ones are extremely hard to find. Just checked the Comichron numbers for June 1995. According to them 7000-8000 copies of The Flinstones #1 were ordered that month. What would the Canadian Variant percentage be for Archie comics titles in ‘95? 10%? 20%? 1%? 5%? At 1% it’s only 80 comics,lol. That can’t be right. At 10% it’s 800 copies which sounds more reasonable. The survival rate for these would probably be much, much lower than dc or marvel titles given the main customers being small children. I believe the Canadian variants lasted into the later issues of this series and Comichron estimates by then were only in the 3000-4000 range so no more than a few hundred of any of those issues were even released in Canada. There is a huge possibility that there may be less than a hundred surviving issues for each issue of this run. Same would be for the Jetsons. Thoughts? Hi Sal, looks like the population of the US in 1995 was 266.3 million people; Canada was 29.35 million people in 1995. So just about 10% of the market size by population would have been Canada — from there, I’m not sure what a reasonable split would be between Direct Edition and Newsstand for Archie but I’ve reached out to someone who may be able to give us some Archie-specific guidance and invited them to comment here. One thing I’ve noticed with Archie is that some of their comics have both newsstand and direct edition Canadian price variants — I noticed this for example when collecting TMNT Adventures #1. I hope you don’t mind me weighing in on Bob’s second point above about CGC’s choice to recognize the Canadian price variant as a “Canadian Edition”. At first glance it may seem to be a play on words or just semantics but I really think he opened up a good debate as there is a big difference between the two, for it means for collectors. With CGC describing the variant copy as a “Canadian Edition”, it implies that the edition was produced within Canada. After all, this is the same label CGC gives to actual Canadian replica editions that were produced in Toronto during the 1940s (due to the War Exchange Conservation Act that limited US imports of non-essential goods into Canada during the war). This is not so in the 1980s. As you’ve already clearly established in prior postings, these 80s editions were printed in the US on the exact same press runs. Secondly, there were 2 types of comics sold in Canada throughout the 80s. 1. “Newsstand copies” or “single copies” as referred to in the publishing business. These are the copies with the price variant covers. Again, these copies were sold at retail check-out lines with very limited volumes because both comic companies and retailers wanted to minimize the amount of “returns” to be credited back on the vendor’s account. Not to mention to minimize the clutter in their stores. These editions required a proper cover price not only to reflect the higher exchange rate at the time but retailers demanded it because they didn’t want any price confusion at the till considering their margins were already minimal and a cashiers mistake of ringing in the wrong price can easily put their profit in the hole. At the same time, this “merchant friendly” adaptation also benefitted the comic companies because it allowed them to grow their distribution points in Canada much easier. And this in turn, would have been a major goal for comic companies considering these retailers provided them with their biggest yield per copy (charged the highest wholesale rates) by far, compared to what they earned per piece from mail subscriptions and bulk rate dealers (comic stores). 2. Direct edition retailers (comic stores). These of course were the cheap “no return” wholesale copies sold in bulk to comic book stores. For these specialty Canadian retailers, the comic book companies decided to provide them with the US direct-edition instead (showing the US price). And being in the publishing business myself, I would only guess that the purpose of this was to prevent newsstand dealers from striking a deal with the comic stores to buy month-old bulk copies at huge discounts, in order to manipulate their “unsold returns” . Back then, it was common practice for newsstand retailers to rip off the mastheads (top half of the comic) of unsold comics and mail them back for credit (in the publishing business, stores are billed for all units upfront, less posted returns). By having two different cover prices for both types of retailers, this type of fraud would easily be caught. So here we have 2 different “cover price variants” for each issue being sold in Canada during the 80s. Yet CGC refers to one of them as a “Canadian edition” despite the fact that both copies originated in the US, and on US presses. Yet “place of origin” is how they currently measure the printed copies from Toronto during the 1940s era. So which is the correct standard? If there is absolutely nothing different between the “editions” of both types of comics sold in Canada during the 80s, and both were manufactured in the US, then it only makes sense to refer to the scarce 75c/95c/$1.60 price covers as a “Canadian Price Variant”, not a “Canadian Edition”. And to Bob’s point, variant collectors use CGC as a baseline to the parameters of their hobby. And sadly, this true “price variant” will never pick up steam without them sanctioning it and calling it for what it is. Hopefully Ben you can forward this along to your contacts at CGC for reconsideration. And thanks again for this great platform for debate and exchange of information. Go Ben! Hi Bob & Tony — I wanted to reply to you both on the topic of naming convention at CGC (and CBCS) when it comes to Canadian price variants (and Type 1A variants in general). I totally agree that the “Canadian Edition” labeling should absolutely be changed, and that for collectors out there who haven’t studied these 1980’s books and haven’t seen the indicia pages with their own eyes, that reading such a label would falsely imply that the comics were after-market reprints produced abroad because that naming convention conflates them with the actual Canadian Editions of the 1940’s/1950’s. Switching to “Canadian Price Variant” would remove that inaccurate and misleading implication, and therefore would be a vast improvement to their current labeling. The name “Canadian Price Variant” also captures the actual physical difference — with identical indicia and interiors, the only thing that physically varies from regular newsstand copies is the cover price, and therefore “cover price variant” is an ideal descriptor. [Personally, I’d like to see the labels read “75¢ Price Variant” or similar with the actual cover price mentioned, but I understand that entering each individual price is a much taller order to accomplish]. For shops, changing what’s in their internal systems might be more doable. Unfortunately though, for CGC or CBCS, making such a change would require a great deal of man hours to accomplish because of the census data — in other words, it is not without cost for these two for-profit businesses to make the labeling improvement. As I understand the challenge, their employees would need to manually change each individual comic book entry for these variants that has ever been entered into the census. [It is hard for me to imagine they couldn’t just do a “find/replace” somehow but apparently it has to be done one by one]. Additionally, if they make the change for the Canadian price variants, collectors of other Type 1A variants will demand the same — so it becomes a project larger in scope than just the Canadian variants because it would also open a can of worms to changing Pence and AUS price variants as well. So whichever of the biggest two grading companies are the first to make the change deserves our applause for incurring that cost and effort, for the benefit of the hobby and its future. My money would be on CBCS to be the first and I will applaud them heartily at that time (they have already made advancements recognizing newsstand comics in general, and I know that it was years between when they first considered the idea and when they finally implemented it). So by this quote, they do get it that the 1980’s variants were printed alongside the other copies (not printed later or printed elsewhere but printed alongside), and they reference in this quote that the difference for the Canadian version is a higher price. And they are indeed “breaking them out” — so regardless of what they’ve called them, they have their own unique census entry and are therefore CGC-recognized variants, in contrast to how they simply “lump together” the US newsstand and the Direct Edition copies instead of differentiating them. So things could be worse: they could be refusing to “break them out” at all! Because of the recent CGC request of my own, and past request before that, I feel I would be badgering the folks at CGC by raising it again and sharing your comments — but, I would definitely encourage you to reach out to them on your own… Hearing more voices will build the business pressure to make the change, by showing them that their customers and the hobby at large demands the labeling change. One way you could contact them is via their Contact page of their website, another is by phone, and a third would be to email them. Archie Comics beginning with 9/95 cover dated regular size format comics started back up publishing Type 1A cover price variants and the new published Canadian cover price was $1.65. The $1.65 Canadian cover price variants that began with 9/95 issues were published for many Archie titles including Archie’s TMNT #71,72 where direct edition copies of TMNT #72 have sold for more than $500.00 on eBay, so imagine what a $1.65 cover price variant might be worth and sell for today). Archie’s Flintstones, The Jetsons, and All Stars (three newly released titles Archie began 9/95 are seemingly impossible to find out there as Canadian cover price variants, try to find any of them and good luck. Archie’s rare $1.65 Canadian cover price variants ceased in late 1997 and the same cover prices began appearing on Archie regular size comics priced for Canada and the U.S. for newsstand editions. Also I would like to point out that Archie Type 1A Canadian cover price variants exist for (Archie 1989 series) Teenage Mutant Ninja Turtles regular size comic books issues #1-58,71,72 with issues #19 and higher as Canadian price variants seldom seen anywhere…even on eBay. -Hanna barbera all stars #1-? -cowboys of moo messa #1-? Please feel free to correct, add, remove any titles anyone feels may need changing to. Anything I’ve listed as confirmed are only for titles where I have a physical copy myself or have seen a picture of a Canadian variant myself. Here’s a question for all: If you had the choice to pick three titles (C.P.V.) and complete their runs which ones would they be and why? Angelo…easy answer…Batman, Detective Comics (simply because it’s BATMAN) and the third I’d say Booster Gold just because of the future potential of that character (wayyyy underused). Turns out Salvatore’s picks of Batman and Detective Comics were #1 and #3 (great answers, Sal!). As DC titles, these also have the benefit of continuing for DC’s longer-compared-to-Marvel window, providing a nice long list of issues to hunt for, and a more substantially sized collection in this hypothetical. I was surprised to see Best of DC come in at title #2 but considering the Overstreet baseline value for each one of those digests is substantial and that there are a lot of them, it makes sense; but personally I’m not too drawn to these digests so I figure I’ll leave them to someone else to collect. Then battling for the #4 and #5 spots on the list are ASM and Star Wars; Uncanny X-Men comes in at a respectable #7 behind G.I. Joe. Interesting site! I recently discovered a Daredevil #69 (1970 issue) with a price that reads “1/-” – no symbol expressing the monetary unit, and the guts of the book are printed in Sparta Illinois, so the same as the domestic edition in all other regards. Any idea what this is? Hi Jeff, you’ve got a Type 1A Price Variant produced for the UK — the “1/-” stands for one shilling. Alright, so I just bought a copy of (Archie Comics) Street Sharks #3 of the limited series (3 issues) with a Canadian cover price of $1.65 which confirms that they do exist. Looking up this title on comichron it appears that only 1300 or so copies of #1 were ordered for Feb 1996. Using Bens 10% Canadian variant reasoning that means that only around 130 copies of this book exist with the $1.65 cdn price? As for issues #2 and #3 the order numbers don’t even crack the top 300, which by their order numbers means that less than 1000 copies of each were ever even ordered meaning under 100 copies of #2 and #3 exist with the $1.65 price. These numbers are insane if that’s true. What’s the survival rate of a kids comic like this? 50%? 25%? I honestly wouldn’t be surprised if there are even 20-30 copies of each still around. Ben, are my numbers correct? So the 10% population guidepost would be applied only to the newsstand pie slice of total copies sold of the issue to arrive at a Type 1A estimate with $1.65 cover price. I’m not sure what percentage of sales for Archie Adventure Series in the later 1990’s took place on newsstands, versus direct editions ordered by comic shops (which is the only pie slice Comichron covers in their monthly sales pages)… But we do know that over at Marvel, in the early 90’s during the “boom” period we had newsstand sales steadily declining while meanwhile we had comic shops springing up left and right (in my own town we went from 1 comic shop to 3) each ordering direct editions in a frenzy to serve collectors, but then there was the “bust” period which soon followed and lots of those shops went away in the latter part of the 90’s (in my town it was back to 1). By the later 90’s Marvel’s newsstand sales as a percentage were likely bumping around somewhere around 10-15% of the total copies sold based on the estimates insiders have published (the following quote for example cites BPA audits for the first half of 1999 and states the newsstand percentage at 14% — https://rarecomics.wordpress.com/newsstand-rarity-discussion-estimates/marvel-walks-from-newsstand/). I don’t know if your Limited Series #3 was also sold in packs like the above, but the existence of these packs raises the question of whether such sales of such packs would show up on Comichron’s numbers — I’d guess they wouldn’t, so Comichron may therefore only represent just a slice of the larger pie of total sales for these issues. As a ~10% slice of the newsstand slice (however large that was for Archie Adventure Series in this publication time-frame), the surviving $1.65 cover price copies have got to exist in extremely small numbers indeed! 3) Star Wars ( Disney will release a movie each year thus keeping them in the spotlight) Also, stories that discuss identity issues are always touching because movie goers tend to reflect and contemplate about their own lives when watching or reading these stories. 2) G.I.Joe (with the Documentary ” The Toys that Made Us” on Netflix and with constant talk about geo political tensions, future G.I. Joe movies can address topics in creative ways that can help us undertstand ourselves better. 3) Transformers (My grandfather bought me these toys when I was a child and it brings back so many memories for those in my generation) .And speaking of my generation, we now have more disposable income than when we were children thus leading us to purchase these variants (as opposed to direct editions which are plenty) just to have something special. In the movies, Optimus Prime came across as a voice of reason and guidance and in some strange way it was comforting for me to look up to this fictional character as a stepping stone to greater things and for a better world. Can you please tell me if these Batman and Detective Annuals were ever published as newsstand editions? I haven’t been able to locate these. I had given up these Marvel newsstand editions, but something I read in your blog indicated that they may exist, can you confirm? Hi David! I haven’t sought the Batman books you asked about so I haven’t personally verified if newsstand copies exist, but I noticed one of the books you mentioned was from the Rebirth so I have a possible lead for you to try calling Mile High Comics — they apparently have been stocking each of the Rebirth newsstand books (see Rare Newsstand REBIRTH Variants Just Added) so they should be able to at least tell you if they ever had one in stock for any given Rebirth issue; they might also be able to tell you if they have ever had some of the others in stock (or not) from your list. While googling to re-find that above Mile High link, I happened across the following, which I hadn’t seen yet: DC Comics Leaves Barnes & Noble Newsstands. I hadn’t been following DC newsstands closely since early on in the Rebirth and so to date I’d simply figured DC was just happily proceeding along with newsstand sales… But this link suggests perhaps DC has now reached the end of the line of their own newsstand sales (but it seems they had a temporary spat with B&N in 2011 that got resolved, so I suppose time will tell what this current news means). On the Marvels, it looks like Grand Comics Database has newsstand entries for both Daredevil 14 & 15, although no pictures; Mike Duke of Hi River Comics had let me know he’d been offered $1,500 if he could ever find the trio of Daredevil #15, ASM Annual #37, and ASM #559, but I haven’t been in touch with him in awhile and don’t know if he ever was able to find them for the person (in this post about halfway down, there’s an interesting Q&A section with Mike, where he mentions this offer. As for ASM #694, I’ve seen newsstand copies listed on eBay on a couple of occasions (I should have thought to grab a picture out of the listing for reference but didn’t); it looks like a couple of sites out there that record eBay sales picked up on a 2017 sale of a newsstand copy of #694 (here’s an example recorded sale). ASM 694 does indeed seem to be one collectors have had a particularly hard time finding; it was mentioned in the comments forum section of this post for example as being “notoriously hard” to find. Good luck David! 🙂 Let us know if you succeed in finding any of these! Thanks for the pic Ben. Another confirmed title with that All-Stars pic. 👍🏻 I am finding the $1.65 books virtually impossible to find. I’ve been to every comic book store and convention in the Greater Toronto Area with no luck. I even combed through a massive warehouse of comics in a nearby city. These are by far more difficult to locate than any Marvel or DC cdn variants. Completing runs from almost any of the titles is going to take years if it’s even possible. As depressing as the outlook is the hunt fascinates me. I feel like a kid again every time I comb through a new bin 😁 Please keep us updated on new finds. Just bought copies of Jetsons #1, Scooby Doo #1 and #20 and Hanna barbera presents #1, all $1.65 cdn variants. All confirmed to exist now. These complete runs are going to be a massive challenge. So comparing the CPV auctions vs. the above direct edition auction examples, the #238 CPV achieved a ~6.9x multiple to its direct edition counter-part, while the #252 CPV achieved a ~1.8x multiple. Hey Ben, I watched that auction. Works out to about $2,400 cdn. I sold my CGC 8.5 for $425 cdn a few days after this. This book seems to be much harder to find in cdn variant and with tattoos than most people realize. While price guide values are mostly subjective, it’s a safe bet that this one is undervalued in your variant price guide. Interesting fact! I recently bought a copy of ” Further Adventures of Indiana Jones #1″ and the CGC label states the usual ahistorical title, ” Canadian Edition”. However, on the right side of the label CGC mentions, ” 75c cover price” !!! 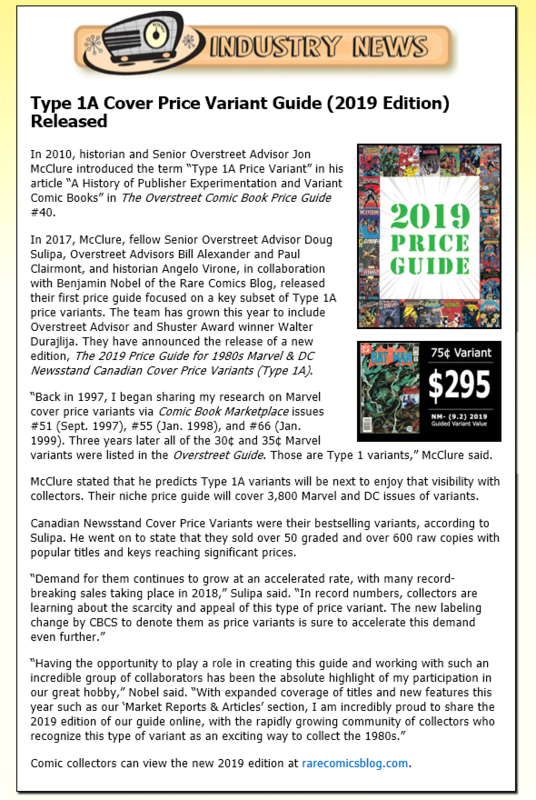 Clearly this is the direction we should be heading towards when it comes to CGC, CBCS, etc… Or to make things easier they can simply write a generic title stating, ” Cover Price Variant” which is still accurate. Ben, would you be kind enough to upload the pics I sent you so others can lean in on a possible discussion . Thanks for sharing this, Angelo! I happen to have a submission in at CGC right now, and I requested they apply this same treatment and pointed out your Indiana Jones book as past precedent. I’m waiting to hear back and will let you know when I do. I honestly think “Canadian Newsstand Price Variant” would cover all basis. It’s the most all encompassing phrase. Canadian Edition leaves way too much up for debate given the actual Canadian Edition books from the golden age. The 75 cent label isn’t descriptive enough (just my personal opinion). The only real circumstance where Canadian newsstand price Variant would have to be adjusted is when dealing with a book like tmnt adventures #1 where some cdn copies are both newsstand and direct. No Crystar in the guide! Just picked up a #8 and #11, 75c and $1.25 respectively and I can confirm they exist! Hi there – quick question re: the guide – should Doctor Strange end at 78 (Aug, 86) as there should not be CPVs for 79-81? thanks! With the 30/35 cent rarities have their been any discussion on determining the region they were distributed (I feel like I read an article once about a color indicator on the pages?) And if there is a region with less distribution? What are they if you can speak to them? Hi Ben. I have an original 3-pack from the same era, still in the shrink-wrap. This one of Wonder Woman 1-3. I can send you a couple of pics if you like. Of course I haven’t been brave enough to open it to see what’s under the comics. Have there been any variant issues for the Atlas comics of the 70s?